I would like to take you on a journey through sitcom history and give you 6 Halloween episodes that are "must see TV" before the little Lady Gaga's, and Justin Beiber's start knocking on your door, October 31st. Every Saturday night on Nickelodeon, "Are You Afraid of the Dark" was the show to watch. I remember thinking the show was dumb, but my 3 younger sisters liked it, so I always lost the vote on what to watch. I do however remember quit enjoying the Halloween episode, "The Tale of the Twisted Claw." It's based off the classic story, "The Monkeys Paw" and had enough similarities to the original story to keep me intrigued, but also had a few twists that caught me off guard. Overall a must see, but don't expect too much. Ok, Ok, yes, I like Glee. Hold your stones, I don't watch it by myself; I watch it with my wife. Does that make it ok? Maybe it's the singing, or maybe it's the fact that there is more drama in every episode than an entire season of Jersey Shore, none the least, it's entertaining. The Halloween episode, "Rocky Horror Glee Show" takes all of the good parts from the original "Rocky Horror Picture Show" and crams them into a 45 minute long episode. The songs and the costumes will certainly get you in the Halloween spirit, I promise : ). By far the best cartoon television show, The Cleveland Show Halloween episodes are hilarious. If you like South Park, The Simpsons, or Family Guy, and you haven't seen The Cleveland Show, you don't know what you are missing. Cleveland Junior, and Rollo generally have a very funny role in the episodes. In "It's the Great Pancake," the chubby adolescent Junior, dresses up like a giant pancake and in one scene, dances to "this is how we do it." My favorite scene from "Escape to Goochland" is when Rollo wears the "Saw" mask and talks to "you" the viewer at the beginning of the episode and tries to scare you, only to be interrupted by his mom scaring him . Make sure you catch at least one of these episodes before Halloween. Being the nostalgic guy that I am, I like traditions. 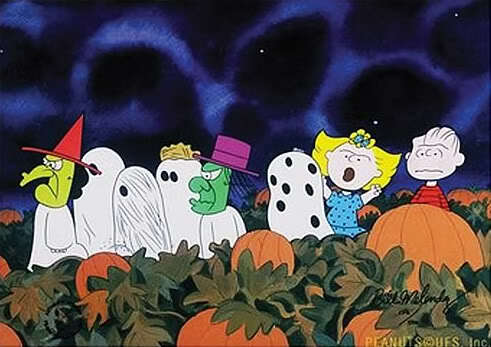 One of my families traditions is to watch "it's the Great Pumpkin Charlie Brown" every year. Though it's only 20 minutes long, and it is actually quite boring, the excitement you get looking forward to watching it makes the actual watching of the episode worth it. During the episode, I am usually either carving a pumpkin, or making pumpkin seeds! Every year after my wife and I are done watching "It's the Great Pumpkin Charlie Brown" we watch "The Nightmare Before Christmas" Just a little tidbit of information thought you'd want to know. For the biggest laugh, watch an Office Halloween episode. My favorite one is "Halloween." In this episode Michael has to fire one of the Dunder Mifflin employees. During the episode Michael is wearing a double head for his costume and in one scene the head talks to Michael and tells him to fire Dwight. 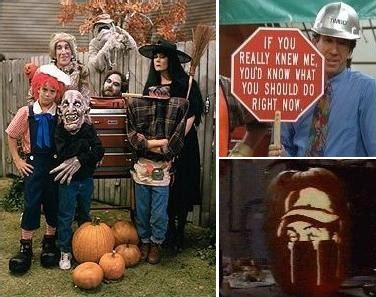 Home Improvement was the master of Halloween episodes. Tim the Tool Man Taylor was always thinking of some scary homemade device to scare his kids or Wilson. From the decorated house, to the Halloween themed Tool Time shows, the overall feel of the episodes made you think fall, and Halloween better than any other Sitcom.